I admit that sometimes I'm a baking wuss. Seriously, I can be such a damn sissy about things that it gets to the point where even I roll my eyes back at myself. When it comes to fluting a pie shell or piping icing I can be a total buttercream drama queen. Now it's not that I don't mind getting my hands dirty. I garden something fierce these days and I've earned the grit under my nails. I've worked with chocolate and beets until the skin on my hands is stained shades of scarlet and henna so dark you would think I spent my time elbow deep in vats dying textiles under the summer sun. Still, we all have our particulars. I for one hate making scones. The general reaction to this is from other bakers one of shock and awe. All of my old pastry teachers have chided me for my complaint. "Why?" they ask. "Why do you hate making scones? They're so easy! So simple! So quick! Four or five ingredients tossed into a bowl, bake, and done. Why such aversion, Garrett?" Simple. The dough is incredibly sticky and I don't like getting messy, tacky, gluten-y (with emphasis on the "glue" syllable in that word) dough all over my hands and fingers. It's an unpleasant texture and I just don't like it. It's gross and unpleasant. Try to clean yourself and - bam! - the faucet is a now a mess as well. It feels like I have chunks of afterbirth sticking to my fingers and, and, and, UGH! And, you know, I follow this up with a melodramatic show of pouting. It's not real bitching if you don't make a show of it. I know what you're thinking; Me!? Drama!? Perish the thought. I'm a paragon of levelheadedness and rationality. Except, of course, when I'm not. Still, through my near-farcical moaning most bakers just stare at me for this truly pathetic recipe hurdle of mine. I can do wedding cake. I can do charlottes. But they are befuddled when in comes to my scone-y whining for the most base of reasons. But not Teresa. No, no. Not the head pastry instructor at American River College here in Sacramento. She who won't scold me. Won't chastize me. Not a single sigh will escape her lips. She just grabs the flour and shows me best. I was about to teach a food writing seminar to her students and had a bit of time before as one of her classes was wrapping up. She noted that she had just taught biscuits and scones the other day and to that I mentioned my aversion to getting my fingers covered in clumps of floury, dusty dough. Furthermore, I added, I just never seemed to really get that super tender crumb that all great scones possess. She looked at me. "Are you kneading them a lot?" "Define a lot," I said with a hint of playful smugness, teacher to teacher. "More than three or four times tops," she said flatly, turning away from me to reach a large mixing bowl and a gallon of heavy cream. "Oh, yes. I knead that thing like a British nanny beats her charge in secret. Should I not?" I replied. And so she began to make scones. She gathered up her flour, sugar, and salt; and while she measured she put me to work chopping a bit of chocolate. She worked diligently, quickly but without rushing, and simply did the steps that had to be done. "Scones," she explained in a scholarly fashion, "shouldn't take more than three to four minutes of your time. They're designed to be fast and satisfying; easily customized to whatever is nearby." She whisked together the ingredients and tossed in the chocolate - "You can use whatever mix-ins you want with this recipe. Fruit, nuts, and cheese is fine. If you want something savory, then omit the sugar." - before adding the cream. She explained that with scones you have to get dirty. Just accept it. A spoon agitates the flour too much and causes too many gluten bonds to develop. Your hands are soft, delicate, careful, and nothing like a hard spoon. Her hands swirled around the bowl clumping and fluffing everything together. A little more cream was poured in for good measure and, ta-da, she had a rough dough. She turned it out on the counter. By then a small group of students had gathered and we all stood quietly absorbing the impromptu lesson. "Just knead it once or twice to bring it together, and then form it into a disc," she said to us all. And that was it. No more kneading. A whish and whisk of her hands with a pat-pat-pat and the dough was formed into a flat disc no thicker than an inch. She took the closest knife and chopped it into a equal pieces. "Brush them with cream," she said as she did so, "to give them a bit of color when they bake." She split them up, baked them, and ten minutes later: Scones. Tender scones. Moist and tasting of cream. Flecked with flakes of chocolate and studded with chunks of it, too. The flavor was simple but riveting. She washed her hands and grabbed a paper towel to clean the faucet where her previously dough-laden fingers turned on the spigot. "You will get dirty. Take off your rings beforehand. Clean up after like you would for any cooking activity. No need to make drama about it." So, now I don't. When I make scones I barely even touch them. I'm gentle and fast. My hands get sticky. The bowl gets covered in adhesive bits of wet bread flour. The sink gets a wipe down with a paper towel. No prancing about the mess of it. You just make scones. Deal with it. Now, these chocolate-coconut scones I made at home are quite excellent for a particular reason. 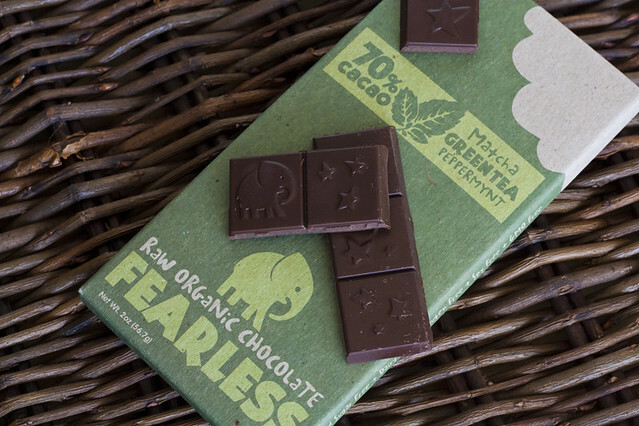 A few weeks ago I was contacted by Fearless Chocolate, a company in Oakland, California. They told me about their chocolate bars and at first they and the chocolate seemed a bit too hippie-granola. The website explained that the chocolate was organic, dairy-free, gluten-free, Kosher, and so on. See? Hippie-granola. Generally, this is a turn-off because these kinds of chocolate bars usually taste as bitter as those unpleasant childhood memories where the class bully teases you. Often flat, gritty, and uninspiring this is chocolate I take pains to avoid. What caught my attention, though, was the fact that the bars were also processed raw, meaning the temperature was kept under 108F to process the bars. Chocolate made with nearly no heat? "I think not," I said to myself. Plus, while once in a while you can find a few palatable raw foods, overall it is a trend of food I wouldn't mind seeing quietly die off like a Kevorkian patient. I admit though, the fact that someone found a way to make chocolate like this shocked me. So I wondered if it was any good? I was intrigued by the e-mail from Daniel, Fearless' PR guy. It was engaging, funny, and real. 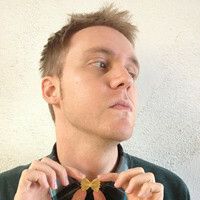 He addressed me by name, demonstrated that he read the blog, and his delightful brand of humor tickled me right. He asked if he could send me some samples to try and - if I liked them - that maybe I would write a post. Between his personal e-mail and the product description I said something I rarely say to product pitchers: Please do. I'm not being paid for this post. I'm writing this little review because the chocolate is simply some of the best I've ever had. Mellow and dark without being overly bitter. The flavors are spot on, dignified, and well blended. The peppermint and green tea bar was both refreshing and subtle. 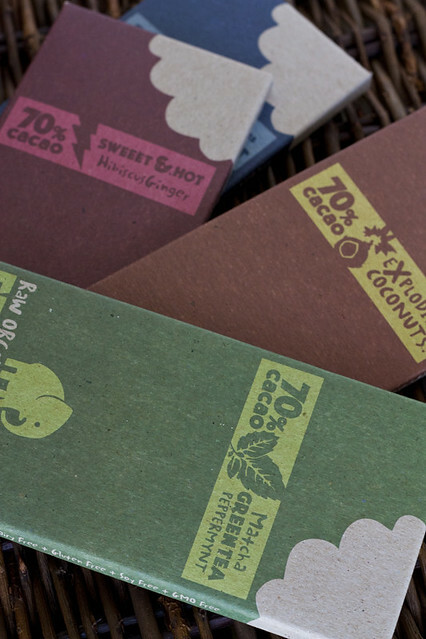 The coconut mixed bar is just bangin' with an intense coconut flavor that even BF, an avid coconut hater, enjoyed. The hibiscus and ginger? As fruity and piquant as a smashing first date. For these scones I chopped up the Exploding Coconuts bar and the Dark as Midnight bar. To that I added a confetti of flaked coconut. The taste was astounding. Full and intense. Even better, the chocolate withstood baking without any sweating or melting. High marks all around. I talked to Daniel and we've got a little giveaway involved for you all. To win this all you have to do is leave a comment in this post. The prize is a package of three Fearless Chocolate bars. Even better than that? There's another prize and another way to win! A one month membership to Fearless Chocolate's Eat Mail, a unique chocolate treat that varies month to month and is sent to the subscriber as a surprise. (Secret: I hear this next one is all citrusy and salty!) Go to Fearless Chocolate's Facebook page and become a fan. Then, comment on the thread about that talks about this Vanilla Garlic post and the contest. See? Easy. The contests close on Friday, July 1st, at midnight. Winners will be announced on July 5th. Best of luck! Please enter and then do yourself a favor and get over getting messy and make yourselves some scones. 1. Whisk together the bread flour, salt, sugar, and baking soda. Next, whisk in the Fearless Chocolate and coconut. 2. Add the cream and use your hands to gently bring together the ingredients. If you need to add a bit more cream then do so judiciously. It will be sticky and clumpy. Turn the dough out onto a lightly floured surface and knead twice (push-squish and push-squish, done). 3. 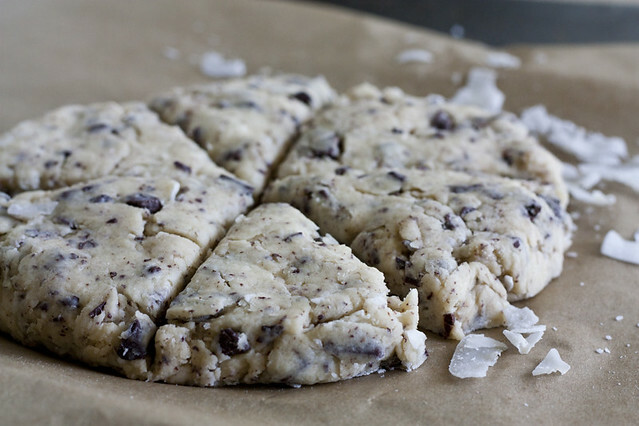 Form the dough into a disc and cut into 6-8 pieces. Brush with a bit more cream. 4. Bake at 425F for 10-15 minutes or until golden. So far my "kneaded dough" life has consisted of a few failed attempts at bread, but successful pies, hand pies, and biscuits - but something has always been missing. I think it is chocolate scones. Yes, definitely chocolate scones. Mmmm, those scones look lovely. And that chocolate is so appealingly packaged! Thank you for all of the great posts, Garrett. I've had so much fun reading and trying new ideas. One of the more interesting parts for me is seeing the difference between the local ingredients you have access to in California versus what I have at hand here in Maine. It's been a fun challenge adapting things to what I can find in my farmers' markets and grocery stores. Also, any advice for first-time kitten owners? Yum! Those look delicious. I've only ever made scones with butter before, never with just cream. I'll have to try these. Ok MAYBE I would get over me fear of making scones with this recipe but coconut will not be in there!!! I too, am a scone sissy. But the incitement of dark chocolate and coconut is so great that I may clean my nightmare of a kitchen and make a date of it. I have never been fearful of baking things like delicate cookies and cakes, pie crusts and breads, but scones have always scared me a bit. Possibly because the one and only time I made them they were like rocks, but less tasty. Your new found drama-less outlook on them has made me strong enough to give them a second try. Thanks as always for your wonderful writings and recipes! I have held the same aversion to making scones as you. They are just too sticky and messy. But, now I will just deal with it and make them. Thanks for the inspiration! Thanks for another awesome recipe. I already contact fearless chocolate to see where they are sold. Awesome! Those scones look amazing. My husband also hates coconut, maybe he'll like these. I have a friend who often reviews chocolate on her blog, and she gave a rave review of Fearless a few weeks ago. I, too, am no fan of the raw food movement, but I would totally give this chocolate a try. Your scones look delicious! I hope you overcome your aversion to them, they're quite fun to make. I think I'll make a batch this week. I also have a small fear for scones but now I am inspired to try! Especially with chocolates involved... I must be fearless! apparently I need an even lighter hand than I was doing. thanks for the lesson. I have to admit, I've been intimidated by most baking projects. I've just moved (yay) into a house (yay) on the other side of the country (um, yay?) and have decided to take on one new baking project per week to break in the kitchen. I think this might be my first! Thank you so much for blogging. I have a whole list of favorite posts that are providing me with my first couple months' worth of projects! My single best piece of advice (on top of everything the vets and your kitten-expert friends have probably already told you)... get yourself and your kitten used to regular claw-trimmings (every couple of weeks or so) and keep it up for the rest of kitty's time with you. It keeps your furniture (and your legs/hands/etc.) much more intact, the vet's assistants happy with you, and your kitty used to manhandling (trust me, it's a good thing). It's not permanent like declawing and if kitty escapes the house, she/he will still be able to climb and get away from predators. It doesn't need to be a big production - I just trim off the sharp points and avoid the pink base where the blood circulates, and I use the generic little scissor-type cat claw trimmers. I love homemade scones, but the effort my mom always put into them (insane amounts of kneading) made me never want to make them myself since I have little patience and even less upper body strangth. But I think this weekend I'm going to try enjoying some coconut chocolate deliciousness. Yum! Thanks for this post. I bet those scones would be yummy made with full fat coconut milk in place of cream, for the vegans in the house. Fearless Chocolate sounds like perfection. I would LOVE to try it. I enjoyed seeing your perspective of the messiness change. Those chocolate bars look adorably cute, and for those who are sensitive to the "x-free" ingredients, it's awesome to know they can get a safe product that tastes great too. Those scones look amazing! I too have had some scones issues, but I'm always willing to try again. Also I am an avid (and I mean AVID) coconut hater, and I've yet to find so much as a flake of coconut that i could enjoy, so I'm highly intrigued by these new chocolate bars. Raw chocolate - crazy. I'd love to try it. not a scone fan myself either - though for very different reasons. Totally understand your scone whining, but these look amazing. Worth the gluteny hands! This chocolate intrigues me, hope I win. Haha! Garrett, I'm glad you've overcome your fear of scones. Great read and lovely photos. Great writing. (Not that I'm surprised.) And the pastry chef was spot-on about not kneading scones too much. Same goes for biscuits! Thanks for the giveaway. Sounds divine! I think maybe I'm doing something wrong when I make scones. They're always painfully dry. Every recipe I've tried, every tweak I've made, scones come out steaming and lovely but within minutes they're as dry as a two-day-old biscuit. maybe I should just stick to making challah with weird fillings; we seem to get along better. I've always loved making scones! I can't wait to make these! If I can find some good chocolate and coconut then they will be breakfast tomorrow. The scones look great. Unfortunately, chocolate rarely survives in my house long enough to be used as an ingredient. If I won the Fearless chocolate it wouldn't stick around that long either. Thanks for the giveaway, Garrett. I haven't mastered scones yet, but I'll have to attempt them again. Thanks for another great recipe to try along with an engaging story. Yay! I love Fearless chocolate. I also love scones. What a fabulous combination. Your scones look delicious! I too like the cream variety of scone, but I've only made lavender scones. I'll be happy to try your chocolate variety! I make biscuits a lot but I've never made scones. The method seems very similar, maybe even rougher than biscuits. I'll definitely have to try this. Thanks, Garrett! I've never actually made scones! They look pretty tasty though, and since my son has finally outgrown his dairy allergy, I think I might need to shopping for the makings for this soon! Garrett, great post. I have the same aversion to pie crust for some reason. It's messy and takes time to roll out and I can never quite get it right. I guess I will just have to get over it like you did. 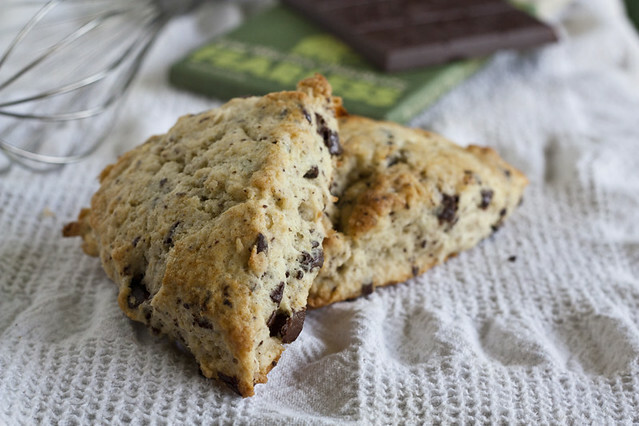 I'd love to win the chocolate so I can try these scones! I also thought they'd be messy, but I actually found a recipe that uses milk and yogurt instead of butter/cream, and they were pretty awesome. So if you want, that could be a healthier alternative. Okay, you have me convinced Garrett... If you can overcome the sticky factor to make scones, so can I. Textures are a difficult thing thou, so I can understand the yuck to begin with. 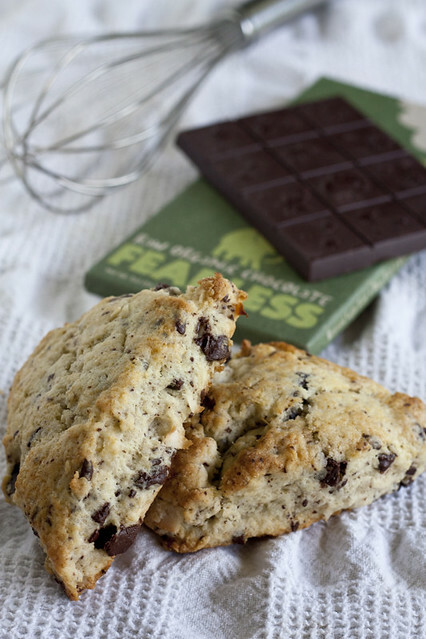 I will say that a savory cheese and herb scone will make me a happy camper, and now I'm thinking a chocolate and coconut scone is next on the list :) Thanks for being brave! I have never made a scone, but you've been my inspiration. These look delicious, and having the ingredients in my cupboard is mighty tempting! BTW, that chocolate sounds awesome, I hope to try it. I can't wait to try making scones this weekend. I've never made scones, so I was happy to read that it's so quick. Those chocolates look great! Looks delicious. Cracked pepper cream scones are a tradition on my Thanksgiving table. Yummm the scones look amazing. So does the chocolate! Sigh, I guess I will have to make these scones. I have resisted the entire scone movement, because they are nothing but high fat biscuits with sweet stuff thrown in, but now that you have printed this, I will have to get off my high horse and try them. Thanks for the chocolate tip, love good chocolate! Ah, Garrett, your post made me smile; I used to react the same way to making pie crust...mine was as tough and hard as a roofing shingle and I always seemed to get flour everywhere. I actually refused to make a home made crust for about 10 years. Then one day, I just decided that it couldn't possibly be as difficult as I'd convinced myself and I just forced myself to take my time and FOLLOW the directions in my Fanny Farmer cookbook. Finally! Success! I've moved on from Fanny Farmer, but I no longer fear making pie crust! It's that personal touch that is missing from so many businesses these days, and it's quite often the reason I choose one over another. Glad the samples matched the PR guy's decorum, and that you were able to create such wonderful treats from it! Excited about the contest! I'll look out for these chocs in San Diego. Crunchy granola sounds like it'd go great in a scone! Good chocolate even better. The scones look great, but I have to wonder: do you really mean bread flour? I thought the higher protein content would make scones tough. Anyway, I love to try the scones and the chocolate. mmm. Not sure why I haven't made scones with coconut before, but that's about to change. They look lovely however I just cannot get into the US version of scones, (still too much of the Aussie left in me). Give me a Devonshire Tea any day! Chocolate in scones sounds amazing; why don't I make scones more? These scones sound absolutely delicious, I had to go out and buy coconut flakes today (though I'll make do with some other chocolate in the pantry). You make me want to try my hand at scones. All the scones I've ever had have been dry as the Sahara! Those scones look great, and I am going to have to track down some of that chocolate for sure. Thanks! I'm afraid of scones & biscuits -- lead balls is more the results. My mother & I have a trade; I make pie crusts, she makes biscuits. Fantastic!! I look forward to your posts every Tuesday. I sometimes even check between Tuesdays to see if I've gotten lucky and you've posted again. :) Thank you for all the wonderful stories and recipes! For my the bitching in the kitchen was always about kneaded bread dough. I grew up in a home with a bread machine which turned out delicious - though midblowingly predictable - bread and I never understood why anyone would bother with something so plebeian as hand kneading. Then I got my first bakery job, just as a salesperson and daytime baker, and the kindly (read: drill sergeant-like) head baker taught me the ways of the kneading. Now I knead bread whenever I can. It makes me feel close to my food, helps me understand the differences between wheat and white and buckwheat and quinoa and rye flours and how they're likely to turn out once the loaf has been baked. Every so often I get a load that's got a little more frustrating than love kneaded in to it but, when hot and slathered in butter, even that disappointing crumb is tasty. Wow, I didn't even realize you could make scones without butter. This I have to try! My husband is the primary scone maker in our house. Not because I won't, but he just seems to make them better. Fine with me! I'd be happy to take that delicious sounding chocolate off your hands! scones can definitely be messy but they are so darned easy you can't avoid making it. I understand your initial fear of the hippie chocolate. whenever I head into a health food store, which isn't often, I feel like I'm being judged because I enjoy eating animals, regular dark chocolate, and coffee that sometimes isn't fair trade. That chocolate does look good though. As for the scones, I love the taste of fresh coconut. I think I'd buy one, crack it open, and shave it fresh like that. Besides, the sweetened flakes don't taste anything like real coconut. I very much appreciate the scone lesson! Yours turned out beautifully. Huh, I didn't realize scones were that fussy. Sure, mine are variable, but that's how much cream I put in them. I like the texture when it's the right degree of shaggy, which is hard to eyeball. Mmm chocolate. And scones. Your post made me think that perhaps I shouldn't fear them, either. That chocolate sounds wonderful! I would love to try some. I'm always in the mood for chocolate and those bars sounds divine! Scones were one of the first foods I learned how to make as a kid. They aren't ever the best scones, but I like squishing the butter into the flour. Pick Me! Pick Me! I wanna try the chocolate! Love the packaging on the chocolate bars. Being an avid chocolate consumer like most everyone else, I am very excited to hear about a "hippie" chocolate brand that is advocated by a pastry chef, especially one whose engaging writing and provocative photography are so eagerly anticipated on Tuesdays. Even more exciting is that this chocolate company is right next door! I will be visiting it as soon as possible. I have no idea if I'm eligible, being in Australia, but I'll always throw my hat in the ring for chocolate :) I've tried a few raw chocolates here in Aus, and only one has been bearable - the rest have been soft grainy pasty icky things. So glad to hear wonderful versions exist out there! I think I'm going to do a savory scone with dinner tonight. I have some cheddar and cream in the fridge calling to me. And I love that I don't have to work with extra cold butter for this recipe! I need to go find that chocolate. Also, I have an overwhelming need to make scones. Kyle: You can find unsweetened coconut flakes in Latino or Brazilian markets. It's much better than the sweetened stuff if you are in a hurry. I have never made scones before but now I must! Yum and thanks for the post! These look really, really good. I adore anything chocolate. I feel like a dummy. My 1st husband was English and loved his scones. I never thought of putting the dough in a big circle and cutting it into 8ths. I always formed each triangle separately. DUH! Someone, please, kick me! 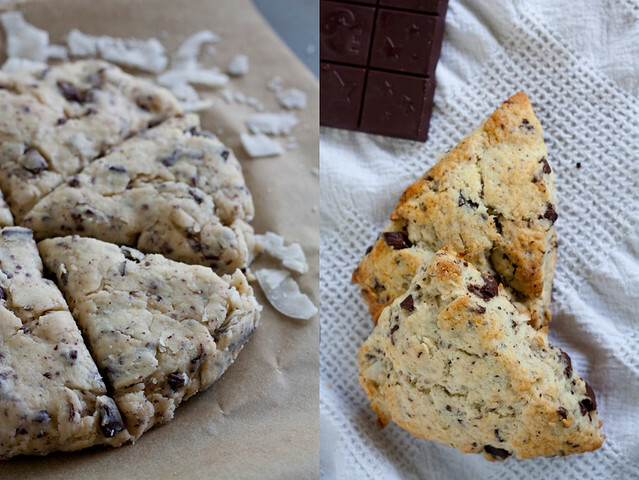 I have always been intimidated of scones but now I have no excuse between your simple recipe and that it includes chocolate, coconut, and a little hippie/granola love. I hope that your giveaway is open to Canadians (Happy Canada Day). I've been to the Fearless Chocolate site and don't see anything about international orders. I usually do tea bicuits, not scones (savory vs sweet?) and the bakery here (Muskoka, Ontario) that sells scones makes them more like a sweet bread than a quick rough dough. I'm with you on the sticky hand thing, I usually mix my tea biscuits with a spoon & drop them into muffin tins! Hmmm. I'll have to try scones again. 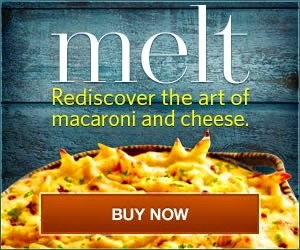 I don't mind the sticky gooey part, but I didn't realize that my 6-8 kneads were way too much. Thanks for the lesson! PMS. SOS. Please send chocolate! Awesome scones!! I must make these ASAP!! Do you know where I can purchase Fearless Chocolate in the Bay Area? I couldn't find anything on their website. THX! !